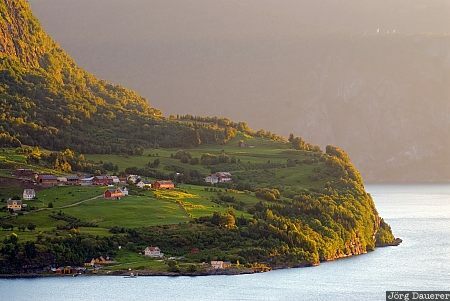 The houses of the small village Fimreite surrounded by green meadows and trees and the water of Sognefjord are illuminated by warm evening light. Fimreite is in Sogn og Fjordane in the southern part of Norway. This photo was taken in the evening of a sunny day in September of 2010. This photo was the image of the month in September of 2011. This photo is in the Photo Calendar "Norwegen". This photo was taken with a digital camera.